Free up your pockets and enjoy your favorite tunes or audiobook while staying connected to your network, wifi, and bluetooth. A slender fit and lightweight design, using neoprene and other durable materials, provides for a hassle-free user experience and allows you to comfortably focus on the task at hand while keeping your smartphone secure. Great for both indoor and outdoor use for exercising, yard and house work, and for use with or without headphones and with fitness/activity bands and watches which communicate with your device. Looking for a reliable, quality product at a great price? You’ve found it! ASCT armbands are sweat resistant and lightweight, yet provide a snug and secure fit for your smartphone. Our design is an ideal balance of quality and simplicity, allowing us to keep prices low. They are specifically designed for your phone model, and have a cutout for the headphone jack. Flexible, Neoprene material is known for holding its shape over time. The clear plastic screen cover is designed for your touchscreen to maintain full functionality, allowing you to access workout apps, switch playlists, and stay connected. We offer an array of vibrant colors, each with a reflective border. Our prices allow you to consider more than one color to suit your style and mood! BRAND MATTERS: hassle-free 1 year warranty, hand inspected in USA, family business you can trust to provide you with quality products and service. FREE YOUR HANDS AND POCKETS: Stay connected and enjoy your workout while listening to your favorite tunes or audiobook! Does not interfere with network, wifi, or bluetooth and is perfect to complement use of fitness/activity bands and watches along with your smartphone. DESIGNED FOR YOUR PHONE: Designed specifically to fit the Samsung Galaxy Note 4, Note 3, or Note 2. This armband will provide a snug and secure fit allowing you to focus on the task at hand and not your phone. SIMPLE TO USE: Dual sizing slots enhance the flexible Velcro strap to achieve the ultimate, customized fit and support for arm sizes up to 16 inches in circumference. See sizing image for additional details! Size extender also available to purchase. FAST AND HELPFUL CUSTOMER CARE: Rest assured knowing you’re purchasing from a company that will respond to your needs through all phases of the sales process. Whether you have a question about the product or something goes wrong, you can be sure that an ASCT customer service rep will do whatever it takes to ensure your questions are answered and problems are solved. BUY MORE SAVE MORE: Buy TWO get 10% OFF! Buy THREE get 15% OFF! Buy FOUR get 20% OFF! 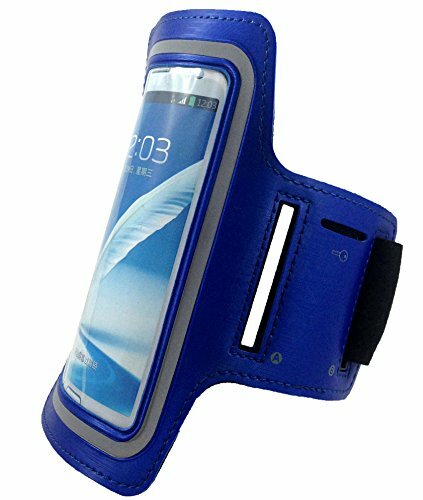 Strong, Sturdy and able to hold the Phone in place First we like to mention that we received Samsung Galaxy Note 4, Note 3, and Note 2 Neoprene Cell Phone Arm Band for Running, Walking, Hiking, and Other Exercise and Sports Activities by ASCT (Black) for a discounted rate in an exchange for an unbiased review. I jog every morning with it and it is perfect and it has opening for earbuds Worked as advertised. I have a Galaxy Note 4 with a rubberized protective case and I do not need to remove case to use this carrier on my arm. You simply stretch the opening on the neoprene case. I can even use touch screen on phone without taking it out. I jog every morning with it and it is perfect and it has opening for earbuds. Recommend if you need your phone or music with you while you exercise!